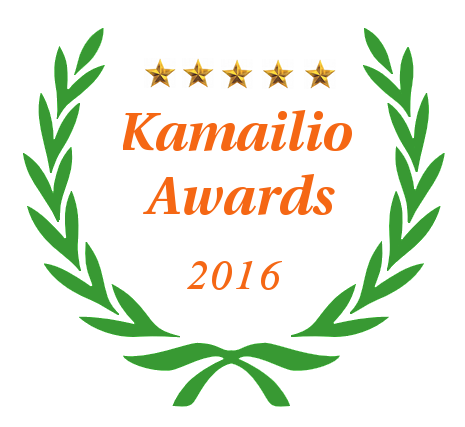 Here we are, the 10th edition of Kamailio Awards granted for the activity related to Kamailio and Real Time Communications during the previous year, respectively 2016. Continuing the tradition, there are two winners for each category, also past winners were skipped from initial selection. 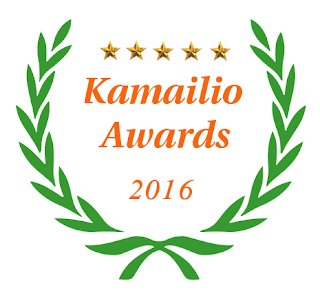 As a side remark, this edition was a bit postponed as I was considering to do a different kind of awards given that last year Kamailio project celebrated 15 years of development and this is the 10th edition of the awards, but finally went for the classic fomat, leaving the special edition for another occasion in the near future. The 2016 was filled with plenty of important events, from the release of Kamailio v4.4.x series in March 2016, to Kamailio World 2016 in May and the celebration of 15 years of Kamailio development in September, along with the participation to other world wide events such as Mobile World Congress, Fosdem, Astricon or Cluecon. The 2017 is keeping up very well so far, the major release series for Kamailio 5.0.x is out, Kamailio World Conference 2017 is like a month and a bit away. The next major release series, respectively v5.1.x, looks very good so far, after one month of development there are three new modules, and another one waiting for merge in the review process of a pull request. Definitely keep an eye on Kamailio project during this year, a lot of new stuff is cooking right now! Back to the awards, here are the categories and the winners! ims_ocs - provides an implementation for Online Charging Server, which communicates via Diameter-Ro interface with ims_charging module, being developed by Carsten Bock. 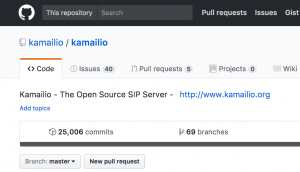 The IMS/VoLTE set of extensions in Kamailio keep growing. rabbitmq - an AMQP connector for kamailio.cfg using RabbitMQ, developed by NG-Voice and Stefan Mitittelu. The module allows to exchange messages with other RabbitMQ peers directly from kamailio.cfg. Sebastian Schumann - an early adopter of the project since more or less the SER times, Sebastian has been a promoter of open source technologies for RTC inside telecoms, highlighting the benefits at many events world wide, including Kamailio World 2016. Franz Edler - he has been very responsive on questions related to the IMS extensions offered by Kamailio, providing a getting started guide and virtual machine images for a basic IMS deployment. Phil Lavin - he has helped to improve the presence extensions in Kamailio, with many patches, testing and reviews as well as answering the questions on mailing lists. VoIP-News.gr - a news aggregator site, promoting most of Kamailio announcements and related blog posts. For someone with a busy agenda, the site is a good source for learning what's new in the VoIP space. VoIPNow (4PSA) - an extensive number of articles about adding various features to kamailio.cfg or managing kamailio, mainly targeting the VoIPNow platform, but easily reusable for any other Kamailio deployment, among them: Fail2ban integration, TLS options, Sipcapture Integration, DoS detection, options to troubleshoot kamailio.cfg, etc. CDR-Stats - an open source CDR (Call Detail Record) mediation rating, analysis and reporting application for Kamailio as well as Asterisk or Freeswitch, working also for Sipwise SIP:Provider. The project is managed by one of Kamailio's old friends: Areski Belaid. ivozprovider - a multitenant solution for VoIP telephony providers designed for horizontal scaling and load balancing. It relies on Kamailio as a SIP routing server for security and scalability, and on Asterisk 13 with pjsip channel for media services. FUSECO Forum - an yearly event organized by Fraunhofer Fokus Research Institute about the new trends, developments and impacts of 5G/IIoT and related technologies, with the 7th edition in autumn of 2016. TAD Summit - the Telecom Application Developer Summit (TADS) took place in Lisbon, by mid of November 2016, event coordinated by Alan Quayle. If working in telecom and not familiar yet with TAD events, you should just do it, the series of events where a lot of innovation in Telecoms is done. Allison Smith - known as the voice of Asterisk, being around the project from its first versions, a constant presence at various events around the world, more or less at each Astricon. Her collaboration from the early phase of VoIP with PBX integrators to provide the high quality voice prompts allowed them to expose a professional feel of the open source PBX solutions, especially at the times when open source in telecom was pretty much disregarded, which definitely helped to go into and disrupt this market. More over, although Kamailio doesn't handle media streams, Allison recorded a jingle for Kamailio back in 2008 when the project got the name. Tim Panton - he has probably touched most of what can be done in real time communications, from serious use cases such as building scalable telecom API platforms to the funny side of interacting with toothbrushes (and other toys) via WebRTC. Seen very often at events such as Kamailio World, Astricon or Cluecon, Tim typically likes to expose how RTC concepts can help to innovate in unexplored/new fields such IoT/IoE. Looking forward to meeting many of you soon in Berlin, during May 8-10, 2017, at the 5th edition of Kamailio World Conference & Exhibition, an opportunity to discuss face to face with Kamailio Project developers. Note: I am solely selecting the winners, with no involvement of Kamailio project members, based on what I observed and has risen my interest during 2016. Also, a rule that I try to enforce is that a winner of a category in the past will not be awarded again same category (a winner one time is a winner for ever). While checking the last pull requests on Kamailio’s Github repository, I noticed that the number of commits to master branch has just surpassed 25 000 (not counting at all commits to stable releases or personal branches). They are counted from the very first day back in September 2001, the migration to Git few years ago converted the commits from old CVS and SVN times. While number of commits is not necessarily a metric of the quality of code, it does reveal a constant and consistent development effort performed during the past 15 years and a half, averaging over 1500 commits per year (n.r., last years with way more commits than the early one due to increase of the number of contributors). The growth of Kamailio development isn’t slowing down at all. The last major release, Kamailio v5.0.0, was out about one month ago and since then we have 3 new modules already part of the master (topos_redis, ims_diameter_server and call_obj modules) and one is pending to be merged being now a pull request (keepalive module). Many thanks to all developers and users that contributed to enhance the set of features, quality and stability of Kamailio over all these years! Should you want to meet face to face with many Kamailio developers, be sure you reserve in time a seat at Kamailio World Conference, Berlin, May 8-10, 2017! More about configuration file engines for Kamailio 5.0 will be presented at the next Kamailio World Conference, May 8-10, 2017, in Berlin, Germany. See you there! The event structure of the Kamailio World 2017 (May 8-10, in Berlin) has been published along with a selection of the conference workshops and presentations. It is going to be agin a balanced content, combining sessions on how to use Kamailio, sharing knowledge on security and scalability as well as presentations about related tools and applications from the Real Time Communications area. Soon the first version of the schedule should become available, keep an eye on the event website!